The roof is almost there! Well, not quite on fire thank goodness, but it is on! Finally, we can stand in the house and not get rained on. There is still a way to go with all the different layers, but it is one step closer. There was talk of using scaffolding to get the roof on to the South side, but fortunately they found a way as it was not an expense that we wanted. We are still hopeful that the windows will be put in by the end of the month, making the building watertight! Tom is hoping that the carpenters will join us for a ‘Topping Out‘ ceremony In building construction topping out is a builder’s rite traditionally held when the last beam (or its equivalent) is placed atop a structure during its erection. According to Wikipedia (that fountain of knowledge) the practice of “topping out” a new building can be traced to an ancient Scandinavian religious rite. A tree was placed on top of a new building to appease the tree-dwelling spirits displaced in its construction. Long an important component of timber frame building, it migrated initially to England and Northern Europe, thence to the Americas. Hopefully, it will be Champagne all round, well when in France…. 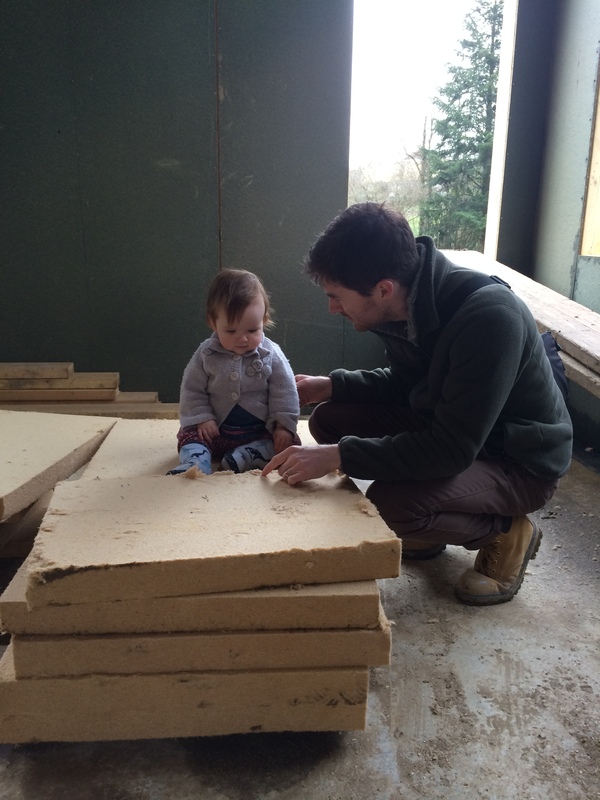 While we were on site today, Tom even took the chance to explain to Molly the insulating properties of Pavatex. As you can see, she was very excited. 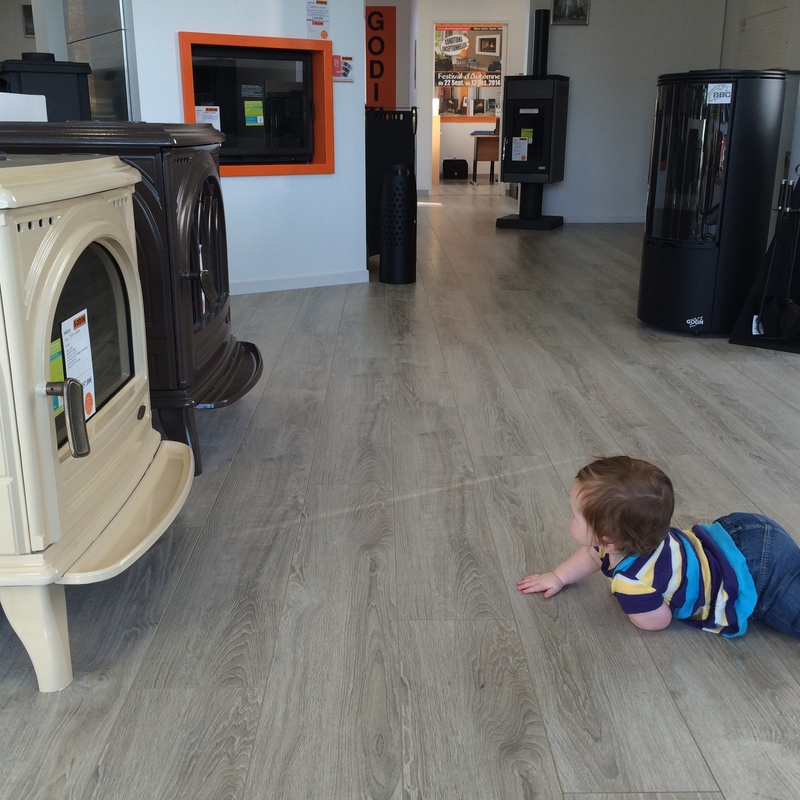 We have also be spending a lot of time in Leroy Merlin, Cedeo and Dupont looking at bathrooms and fencing. Some big decisions need to be made over the next week and we can’t make these without seeing the type of bath, loo, taps and sinks that we will have. As always it is hard not to get carried away! Slightly less exciting, but just as important is the dry lining and door packages. Tom is doing his best to get me enthused about this, but compare this to choosing baths and there is no contest. Rain is forecast for the next couple of days, so I think a trip to Ikea in Bordeaux might be on the cards. I wonder how the French Ikea experience will compare to that of the one in Croydon? Categories: French builders, French House Build, House Construction, Interiors, Marandat, Montemboeuf Plot, Roof, Timber Frame | Tags: Cedeo, dry lining, Dupont, Leroy Merlin, Marandat, Pavatex, Rain, Roof, topping out | Permalink. Our house, it has a crowd, there’s always something happening – Chez nous il y a beaucoup de monde, Il y a toujours quelque chose qui se passe. 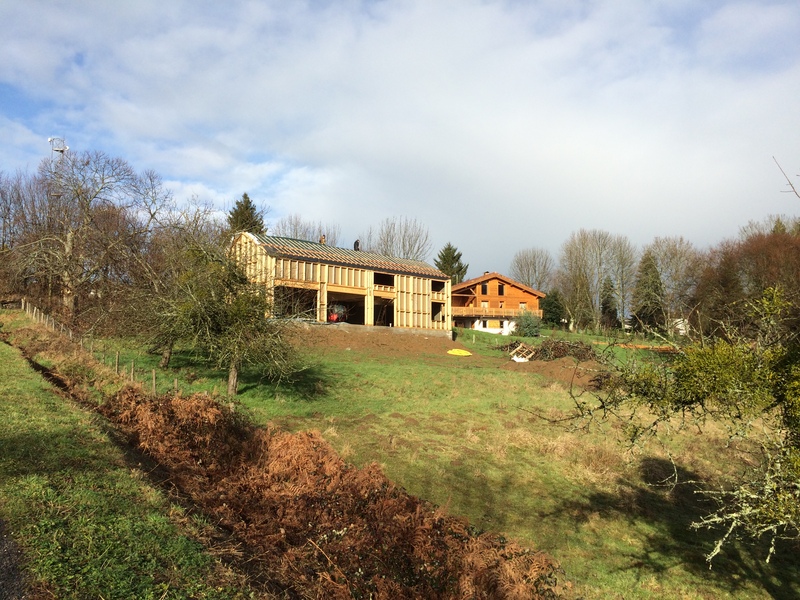 Just a few photos to update you on the progress of the house. These were taken just before Christmas. Work is due to start on site again tomorrow. We are expecting and hoping for a flurry of activity. Categories: French builders, French House Build, House Construction, Marandat, Montemboeuf Plot | Tags: Marandat, Montemboeuf Plot, Timber Frame | Permalink. It has been a busy couple of days over here in the Charente, we have met with our builder, Stuart and also Claude from Marandat to confirm final designs and details for the build. Tom did make a few final changes to the designs, but we both think that these changes have improved the design and make for a better overall and workable layout. And yes, the 10cm rise int he roof height is still there – woooo! Thursday 18th September was a very big day because this was when we signed the contract with Marandat and handed them a big cheque (scary). Thankfully, overnight the lovely people of Scotland decided to stay with the UK, which resulted in a spike in the pound-euro exchange rate (along with diggers, something else I have become quite interested in). This meant the cost of our build became a little bit more affordable. It is amazing what a few cents on the pound can make! To celebrate the signing, we took a trip to Super U and bought some champers. We’ll be drinking it with Al, when he comes over later this week. We have also been in contact with the various utilities companies in France, SAUR for water and EDrF for electricity. We are also meeting a man about drainage (exciting times). Luckily we have mains drainage so no fosse septic needed. So far the only evidence that we have seen that the utilities companies are doing anything are a few spray paint marks on the road. If the companies are anything like they are in the UK, we could be waiting a while! After the signing of the contract, we made a final visit to the plot with Stuart to confirm the location of the house. He hopes to start in the next couple of weeks. 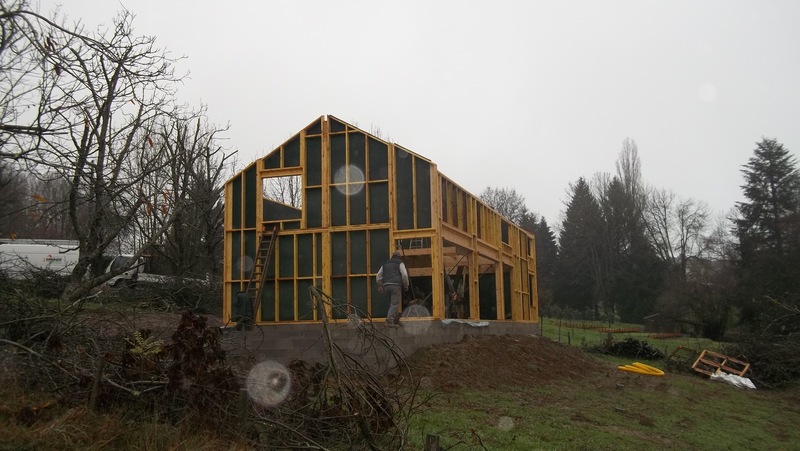 Once he has finished, hopefully by late October/early November, the timber frame can go up. The terms of the contract with Marandat state that the house should be water and tight by Christmas, this means our house will have doors, windows and a roof (my garden shed is bigger than this). Once we all get back from the Christmas break, they will start on the internal works, such as stairs and walls. It was then time for a bit of a holiday. We first headed towards Cognac to stay with our friends at Maison Maurice for a couple of days, before heading to our gite near Salle-Lavelette. On the way we managed a trip to Angoulême to experience the circuit de remparts. Although there wasn’t any racing while we were there, we saw plenty of fantastic cars on the way there and parked all round the town. It is definitely something that we would both like to visit and experience again. Tomorrow, it is back to work. Our brother-in-law Al is a Landscape Architect, with his own Leeds based practice, Laand. He is coming over to visit the plot. He will be doing the garden designs for us, so needs to see the site to get an idea of the work involved. There is quite a lot of land so he will have plenty to work with. Although as it is a sloping site, he will have a few obstacles to overcome. Still, lots of exciting times to come! Poussez les dents – teeth coming through! Categories: Construction, Marandat | Tags: circuit de remparts, Exchange rate, Maison Maurice, Marandat, SLM construction | Permalink. Molly checking the sign is in its proper form! 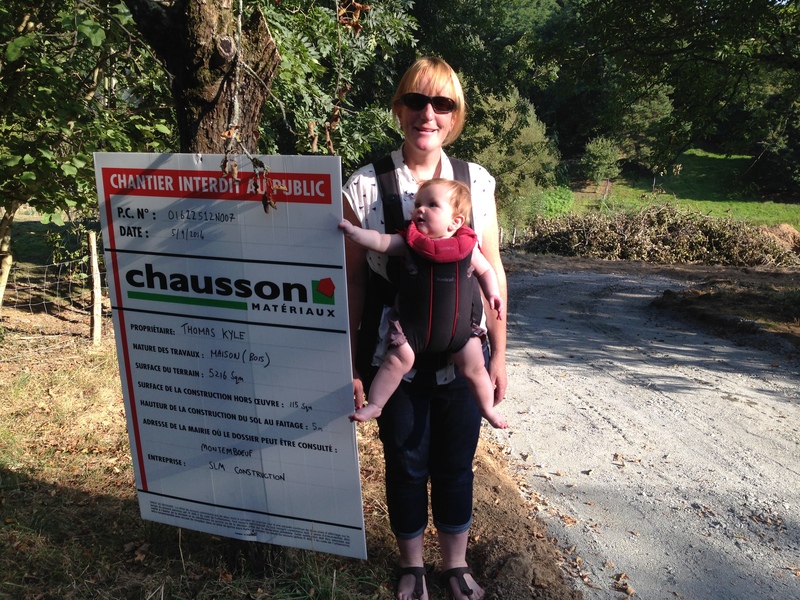 Today, Tom, Molly and I paid our first visit to the site since the ‘ouverture du chantier‘. Even though it doesn’t look like much at the moment, this was a very exciting step in the whole process. We were also able to meet our builder, Stuart, on site to discuss the setting out of the house to make sure the foundations are put in the correct place. Although we do have a rough idea, these can not be finalised until we have the drawings from Marandat – our timber frame company. After having had a meeting with Claude today, we hope that Stuart will have this drawing by the end of the week and then Stuart can start the works! What to do with the wood? After visiting the site, we took a trip to see our timber frame company to go through their quote and to get an idea as to when they can start on site. It all looks possible for them to start in November, as long as Tom and I can be decisive about the designs and the type of windows we want. There is far more to choice of windows than just their alignment, we have to decide colour, opening style, finishes as well as deciding the sort of shutters we want – I never imagined I would take so much interest in a window. If the choice of windows is difficult, I dread to think how we will be on kitchens and bathrooms! Luckily, Tom and I seem to like the same windows so the choice is not as bad as it might be! A few other design decisions were made today and I am happy to say that we have (and this is very important), agreed to raise the roof by 10cm! Wow, you might think, but this is a very significant design decision that I (no, seriously I did) pushed for. It means that we don’t have to trim the bedroom door frame in one corner. It would have been one of those things that niggled at me in my old age. Oh no, I am turning in to Tom…..! Categories: Construction, Marandat | Tags: foundations, Marandat, SLM construction | Permalink.